"I have been building engines and strokers for quite a while. Until the last few years, I was not a fan of stroking a crankshaft mainly because of the reliability horror stories. When I sent crankshafts out to be stroked, the results were always “pretty close” to being accurate but each one required unique adjustments to port timing and performance. I wanted repeatability." "To take a stock crankshaft and stroke it requires the old crankpin hole to be welded up and the pin hole redrilled. I found that many stroked crankshafts when they needed to be rebuilt, (if rebuildable), the pin tightness was less and less. Some builders weld the pin in place to keep the crank aligned for that very reason. Additionally, when relocating the crank pin, the crankshaft stuffers must remain in the same position creating more offset of the balance weights. Some builders use aluminum crankshaft stuffers which requires a lot of crankshaft weight to be removed to get the crankshaft back in balance.. the crankshaft mass that is removed, increases the crankcase volume which decrease fuel transfer pressure.. not good. " "Our crankshafts are built to be 112 crankshafts, stuffers are located properly, balanced perfectly and crankcase volume is slightly decreased, increasing crankshaft transfer pressure. 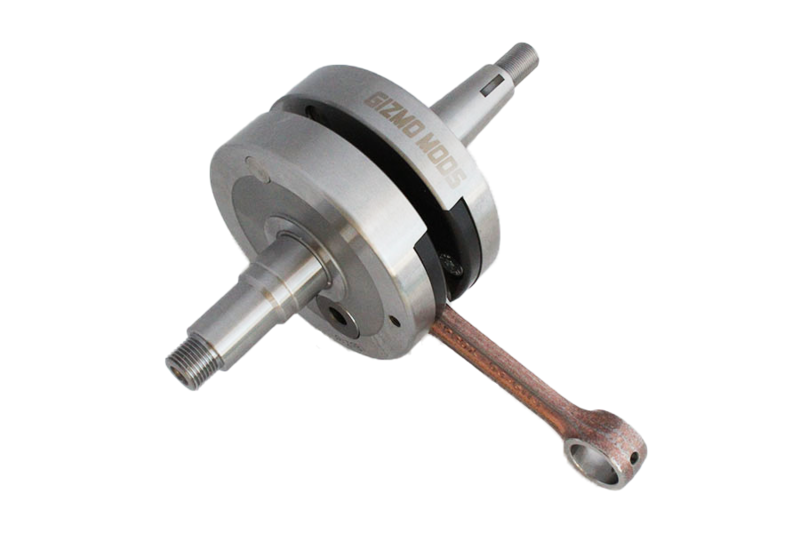 The crankshaft metal is tempered as one so the crankshaft is rebuildable numerous times without fear of twisting from a loose pin and our crankshaft is slightly heavier to add more torque. My decision to have them built was due to the inconsistent reliability and life of past crankshafts I had built from various builders and to add torque via mass which will not happen with a stock 85 crankshaft. "